An Objectivist Individualist: Is the Earth Still Warming? Is the Earth still warming? The answer depends upon whether one examines the surface temperature or whether one determines the heat content of the subsurface. Because the oceans cover 70% of the Earth's surface and water has a very high specific heat, the oceans hold a very large amount of heat. But, if the sea surface is warmed, it takes a good time for that heat at the surface of the ocean to percolate downward to substantial depths. Over the last 17 years the surface temperatures have been nearly constant, though the recent trend actually appears to be a slight cooling. This cooling makes good sense given the solar activity cycle. That solar cycle is imposed on a long term near linear warming which has been ongoing since the end of the Little Ice Age. The long warming since the end of the Little Ice Age is because the oceans have been slowly warming to greater depth since the surface temperatures increased after the Little Ice Age. Contrary to some claims, the Little Ice Age was a worldwide event, though there are some interesting differences between the northern and southern hemispheres in the timing of the coldest periods, perhaps due in large part to the greater ocean coverage in the southern hemisphere. Figure 1. The surface temperature since the end of the Little Ice Age showing a near linear long term increase in the temperature with the variations in the solar cycle superimposed upon that linear increase. The red dot with the green arrow pointing at it was the temperature recently. That temperature is consistent with the expected effect of the solar cycle heading toward its normal cooling phase. Superimposing a sinusoidal wave on a positively sloped line will produce a nearly flat sum when the sinusoidal curve is early in its decreasing mode. The Australian Climate Commission just released a claim that the Earth continues to warm. Clearly the surface temperature is not continuing to warm, so what is the basis of its claim? It is that the heat content of the subsurface ocean is continuing to increase. Well, of course it is. Since the surface temperatures are almost constant for the last 17 years and it takes a long time for the heat in the shallow depths of the ocean to work its way deeper, this is just what one expects. Indeed this gradual long term warming of the ocean to deeper depths is the basis of the linear long term temperature increase since the end of the Little Ice Age. Ocean temperature data to greater depths is being added to the heat content studies of the oceans. Let us examine one such study's results. 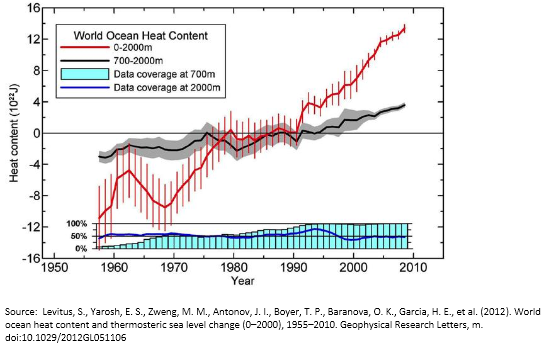 The heat content of the oceans to a depth of 2000 meters is shown with the red line. It has been rising generally since about 1969, though that rise paused from about 1979 to 1990. If you examine the black line measuring the heat content between 700 m and 2000 m, it shows no significant rise until about 1993. Basically, this tells us that the increasing heat content in the 0 to 700 m depth from 1969 on did not substantially cause warming in the oceans at the deeper depths from 700 m to 2000 m until after 1990. The time lag is a couple of decades. So, if the surface warming stopped 17 years ago, that does not mean that the ocean will not continue to increase its heat content for more than 20 years afterward. Suppose the surface temperature had been at a certain constant temperature for a long time and then increased to a higher temperature for a substantial period of say 30 years. For about 20 years the first 700 m depth of ocean water would warm, but greater depths would not. Then the water deeper than 700 m would start to warm. Throughout this entire time the heat content of the oceans would be increasing. This would be useful in moderating the cooling coming on as the solar cycle goes into its next cooling cycle. It would be even more beneficial if the solar cooling cycle were entering a 206 year more dramatic cooling cycle such as we saw during the last 1500 years or so. Since we had terribly cold weather from about 1810 to 1820, we are about due for the start of another very cold cycle. Many solar scientists have become very concerned that this present solar cooling cycle will be anomalously cold. The continued warming of the oceans to greater depths is no evidence of any unnatural effect and it most certainly is not evidence of man-made global warming due to the use of fossil fuels as is being claimed by the Australian Climate Commission. Such claims are scientifically so bogus that they can only be interpreted as attempts to mislead the People with fallacious arguments. This is a matter of scientists and the politicians, who provide scientists with almost all of their research money, conning the People. There is a great deal of power, wealth, and prestige in being able to con the People.